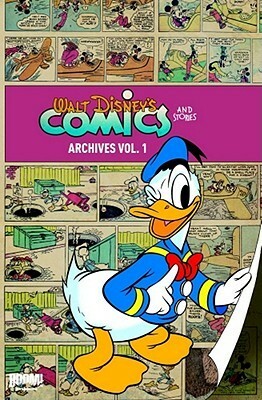 This volume reprints, in their entireties, the first two issues of Walt Disney's Comics and Stories. The comics are mostly reprints from the Donald Duck and Mickey Mouse newspaper strips of the time, with some text stories. Floyd Gottfredson's Mickey adventure strips are the highlight, with Al Taliaferro's Donald gag strips not far behind. The text stories are pretty much plain awful. It's a shame that BOOM! is no longer reprinting these classics. Fantagraphics is now reprinting the Gottfredson strips as well as Carl Barks' Duck stories (at a higher price, although nicer packaging), so we may eventually get most of what BOOM! was going to reprint, but in a different format and probably without lesser known secondary characters. Taliaferro deserves to have his complete work reprinted. I grew up reading Disney minibook comics and I got the same feelings from these Archives. More please! Floyd Gottfredson Al Taliaferro - Arthur Floyd Gottfredson was an American cartoonist best known for his defining work on the Mickey Mouse comic strip. He has probably had the same impact on the Mickey Mouse comics as Carl Barks had on the Donald Duck comics. Two decades after his death, his memory was honored with the Disney Legends citation in 2003 and induction into the Comic Book Hall of Fame in 2006.